I have just returned from Tanzania, where I dedicated 6 days to climbing Mount Kilimanjaro, the world’s highest free standing mountain. This was certainly no easy feat, however it has quickly propelled itself to one of the most exciting and challenging things that I have ever done. The great thing about climbing Kilimanjaro is that you do not need to be super fit, super strong or crazily well toned. The most important thing is that you need a strong mental attitude and proper kit. If you do not usually do much exercise it is important to get used to the great outdoors and being active, so that you have confidence in your ability before you head off. The main limiting factor to summiting however is altitude sickness, for which we can do nothing. There are several official routes up Mount Kilimanjaro. 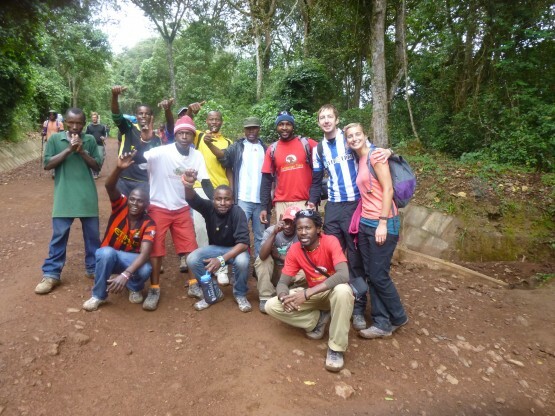 The most popular is the Marangu Route, which takes 5 days in total and has huts to sleep in. The second most popular is the Machame route, which takes 6 days in total and has campsites only. 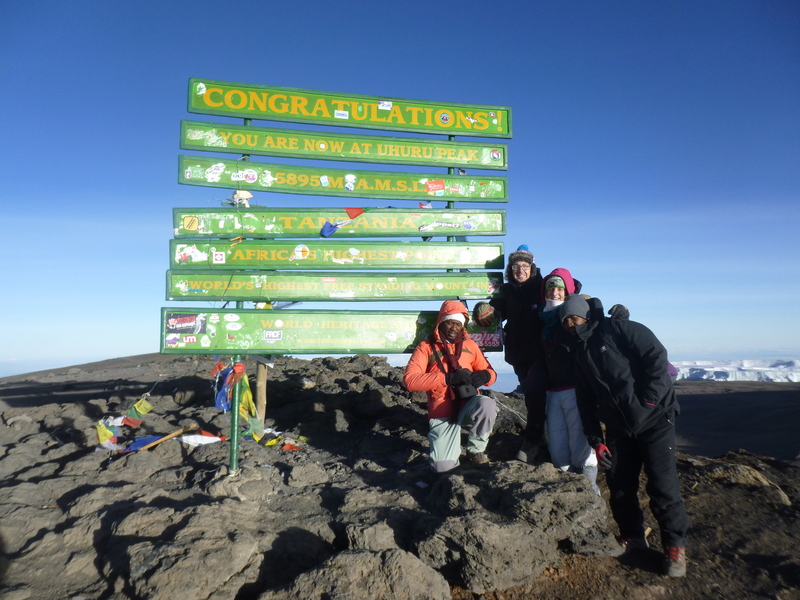 This route is harder than the Marangu Route as there is a lot more climbing to do, however success rates of reaching the top are a lot higher, because you acclimatise to the altitude a lot better. Day one begins at 1640m. You climb for just a few hours through tropical rainforest to reach an elevation of 2850m. I was surprised even at the start of the day how I couldn’t run around with as much energy as I normally would at sea level- I felt slightly breathless doing a simple jog. Your pace is slow however, and the guides encourage you always to go “pole, pole” (slow, slow). This means that you very rarely have cause to get out of breath (hallelujah!) and you can let your body acclimatise as well as possible. The climb was amazing, as you see beautiful flowers, the thick canopy of the rainforest and also lots of monkeys if you’re lucky. The campsite was situated just on the edge of the rainforest, and the delicious and hearty dinner was a great round off to the first day! We awoke feeling refreshed on the second day and set off for the 4 hour gentle climb to the next campsite. The terrain changed as the day went on, with the plants becoming shorter and less populous the higher we got. We were still wearing shorts and t-shirt throughout the climb, however on rests it was necessary to pop on a jumper. The terrain became pretty rocky, and although I have never been to the moon (! ), the landscape seemed pretty lunar to me. On arrival at the campsite we had a late hot lunch, and went for a short acclimatisation walk. This meant that we rose another few hundred metres only to come down again; this helps the body to cope with the reduced oxygen levels. At the end of this day I had a slight headache, associated with the reduced oxygen in the air, however this went away with painkillers. After a great night’s sleep, I felt as right as rain once again. Day 3 was a tough day! We climbed quite considerably in the morning, before dropping down again to a similar altitude of day 2. As painful as this might feel, climbing to a higher altitude and then dropping down again really increases chances of summiting Kilimanjaro. The terrain was even more lunar on this day, and I don’t really recall seeing any plant life. We climbed to a towering lava rock, formed many years ago when Mount Kilimanjaro was an active volcano. The rock formations were incredible, and you start to see the top of the mountain that you are aiming towards! The views are tremendous. It was amazing to wake up on day 4 and see the clouds far below our campsite. This was one of my favourite days as it involved scrambling up the Barranco Wall, a 300m rock face, before dropping down into a lush valley, and heading up again. It was certainly a tiring day, owith about 8 hours of walking. The altitude sickness kicked in at the end of the day, as did the nerves. Tonight we would be heading to the top! We headed to bed at around 8pm, to be awoken at 11pm for a hot drink and some grub. The ascent started at midnight. Very chilly night! To climb the mountain I wore thermal leggings, fleece trousers, thick walking trousers and ski trousers. On the top I wore a thermal vest, under armour, fleece jumper, fleece jacket and a ski jacket. I wore two pairs of gloves, a balaclava and a hat. I was definitely warm enough! The climb is very eerie. It is pitch black, and you just see a trail of lights from the head torches winding their way up the mountain. Putting one foot in front of the other is all you can do for the next 6 – 7 hours of climbing. My headache slowly receded as I climbed, however I felt very weak. The sun rise casting light on our path dramatically increased morale, and I felt like I had a second wind. Reaching the summit at 06.45am was an amazing feeling, especially to see the clouds so far below. Seeing the glacier and the eerie lunar landscape was incredible too. Once we had “the picture” we made our scramble down- a further 4 hours of walking! A day of downhill walking! It took us about 3 hours to descend through the rainforest to the huts at the bottom. Here our support team, 11 people in total, broke into spontaneous song and dance to celebrate our achievement. It was the best possible end to an unforgettable 6 days.